Rangers manager Steven Gerrard hailed the influence of Scott Arfield after the midfielder’s hat-trick downed Motherwell at Fir Park. The former Burnley star netted twice in the first half before receiving a selfless pass from Jermain Defoe to complete his treble after the half-time break. Gerrard later revealed that his decision to play Arfield further up the park, as one of the front three, was influenced by playing against the Canadian international in English football. The hosts started the brighter of the two teams but contributed to their own downfall with three horrendous defensive blunders. First Tom Aldred tried to cut out Jermain Defoe’s through ball to Arfield on 22 minutes but succeeded only in playing the Canada international into an even better position to score. 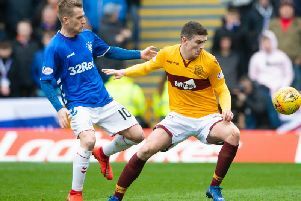 His defensive partner Charles Dunne then sold team-mate David Turnbull short with a needless pass six minutes before the break that allowed Rangers to steal possession and again tee up Arfield. His treble was wrapped up on the hour mark when the Steelmen were again suckered by Rangers’ relentless pressing as Gerrard was left purring. The Ibrox boss - who watched the game from the stands as punishment for his part in last week’s Old Firm controversy - added: “We were certainly very clinical in front of goal. Scott’s finishes were all excellent in different ways but as a manager I’m more pleased with the all-round performance. “You’ve got to give Sean Dyche the credit for (seeing Arfield in a more advanced position of late). I played against Scott many times when he played that narrow left-sided role for Burnley. “He’s very effective at it but he can do it from both sides. He’s a very clever individual out on the pitch, he understands tactics and he understands where to be in and out of possession. Well boss Stephen Robinson vowed to stick by his new high-risk game plan despite the defeat. He said: “We cost ourselves the game. I don’t think there was any great Rangers play which won the game, it came from three individual errors. “We don’t deal with the ball in our own box when we should clear it and that leads to the first goal. We are playing differently, we are playing out from the back, it’s risk versus reward, and our decision-making was poor for the next two goals.